There’s no doubt that strawberry lemonade is a summertime classic! Take it to new heights in this delicious dessert shooter. Lemon curd comes together nicely with fresh, ripe strawberries and a dash of coconut for the perfect tropical treat. Add extra coconut or nix it entirely to make it exactly how you want it! 1. Make the Lemon Curd: In small saucepan, whisk together egg yolks, eggs, sugar, lemon juice and zest. Cook over medium heat 7 to 8 minutes or until mixture is thick enough to coat spoon; whisking constantly. 2. Remove from heat. Stir in butter a few cubes at a time, stirring until incorporated after each addition. Strain mixture through a fine-mesh strainer into a storage container. Cover and refrigerate at least 2 hours or up to 1 week before using. 3. Assemble the Shooters: Divide lemon curd between eight (2-ounce) shooter glasses. 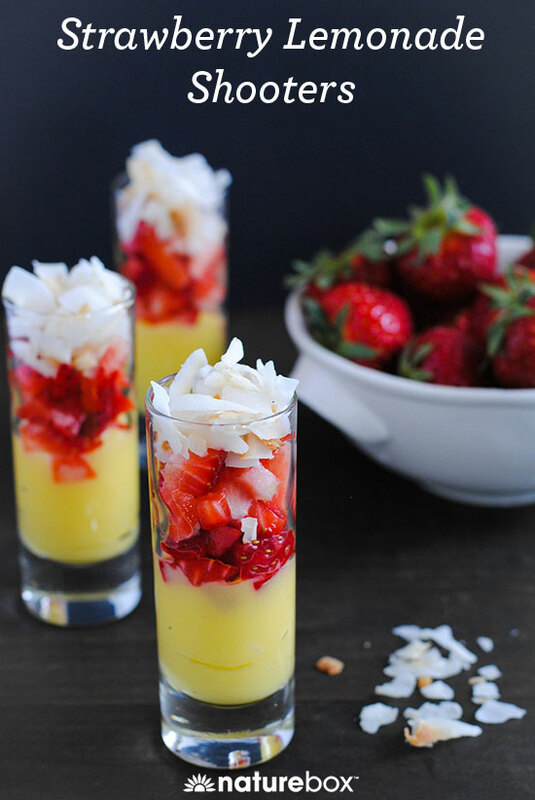 Top with strawberries and coconut. Get more motivation and healthy ideas by signing Up Favorite Run Newsletter.